In celebration of the 10th year anniversary of her debut album Cafe Bossa, PH Bossa Nova Queen Sitti, surprises her fans as she ventures on a totally new genre- EDM or Electronic Dance Music. 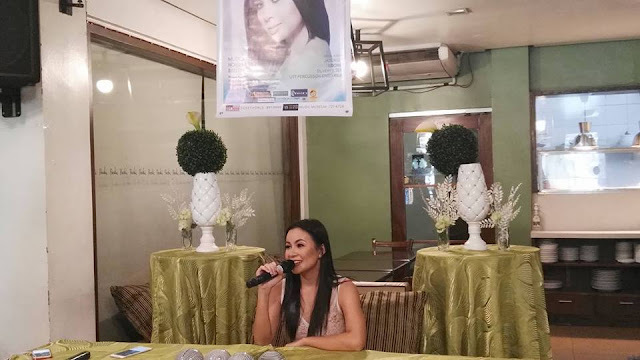 “We just wanted to try something different, to surprise my fans,” Sitti told media at a recent press conference held at Packo’s in Q.C. Sitti admits she was quite apprehensive when it was first suggested, but reiterates that she wont be abandoning her Bossa roots. “EDM is such a big hit nowadays, so I just wanted to try out something new.” I’m having fun doing EDM and I am working on a new album that will showcase my experimentation with it,” explained Sitti. Curious music lovers and Sitti fans can witness her electrifying transformation via a two-night live concert dubbed ElectroSITTI to be held at the Music Museum (1502 in Greenhills, San Juan) on November 25 and 26. Concert guests include rapper Looney and balladeer Jason Dy. The UST Percussion Ensemble will also be on stage with her. ElectroSITTI, which also serves as Sitti’s birthday concert (she turns 32 on November 29), is a two-part show, the first one paying homage to her bossa nova roots, and the second part presents her in EDM numbers. Sitti is collaborating with her friend and EDM master DJ Silverfilter. She hopes to please more younger-generation music fans. “I’m having fun doing EDM and I am working on a new album that will showcase my experimentation with it,” explained Sitti. Café Bossa was released in January 2006 and spawned hit singles including “Para Sa Akin” and her versions of “I Didn’t Know I Was Looking For Love” and “Tattooed On My Mind.” By September that year the album was certified Double Platinum, with over 60,000 units sold. ElectoSITTI, will be a two-part show, the first one paying homage to her bossa nova roots, and the latter hour presenting her in a new light – bright and booming. And the loud and festive birthday party begins. “I’m having fun doing EDM and I think of it as a way to introduce myself to the younger market,” explained Sitti who is visually glowing a year after tying the knot with the love of her life, businessman and music aficionado Joey Ramirez. The multi-talented charming woman, who is also into acting both on stage, having performed in “Katy The Musical” and “Spring Awakening,” and on TV, appearing on past ABS-CBN shows “Isabella” and “Your Song,” will have rapper Looney and balladeer Jason Dy as guests. The UST Percussion Ensemble will also be on stage to share spotlight with her. Fans have something more to feel excited about as Sitti already wrote a couple of songs called “Tangled” and “Bid Your Love” and will unleash both live and ground-shaking come ElectroSITTI nights. Sitti had come a long way since performing in her first gig at a hotel in Roxas Boulevard that already changed its name today. She is managed by Asian Artists Agency and is signed with MCA Music major record label which by coincidence asked her to employ electronic music for her new album. My friend is a famous singer. She recently threw a party at one of top event space Chicago. It was just fabulous. I loved all arrangements and decorations. Went there with a beautiful flower bouquet to congratulate her.